DP 8.05, Microtonic 3.1, MAC OSX 10.8.5. 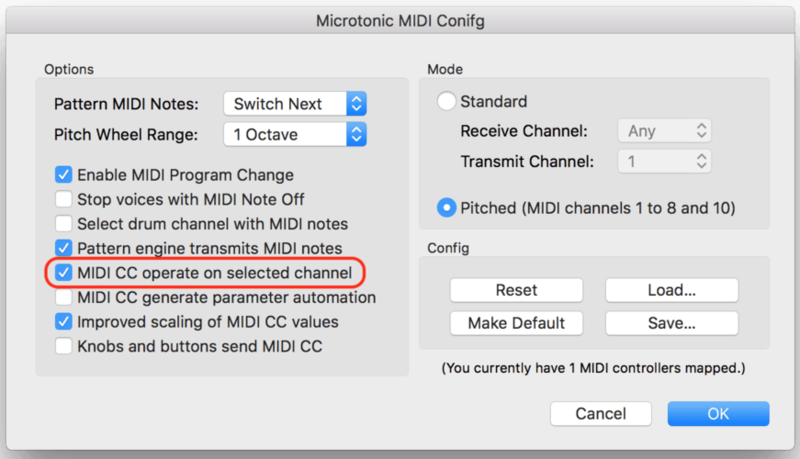 Using MIDI channels 1-8, pitched MIDI mode. Each Microtonic channel correctly receives noteons. Assigned CC7 to the "level" knob for every channel. However each knob is beahving like it is in Omni mode. For example, CC7 messages on MIDI channel 4 are being received by MIDI channel 3 (and all other channels). You can see the knobs acting as the union of all MIDI CC7 data in all 8 Microtonic-assigned tracks in the DAW. In "Pitched Mode" this means "listen to CC on individual channels 1-8". Sorry if it is not very clear. thanks for your sooo quickly reply.and I am sooo sorry about my word.however,microtonic is the best percusion synth all over the world.thanks for you work.